Benn Robinson is a retired Australian rugby union player who played 72 games for the Wallabies, holds the honour of most caps for NSW Waratahs with 155. Has won 2 premierships with Eastwood and the 2014 Super Championship with NSW. Benn grew up in Sydney’s north west suburb of Glenorie attending school at Glenorie and playing his early rugby at Beecroft Rugby Club, before attending The King’s School 1994 – 2002. In his final year at The King’s School Benn was a member of 1st XV team that won the GPS premiership against Newington College and went on to achieve selection for NSW Schools and Australian School Boys. After finishing school Benn join Eastwood Rugby Club where he had participated at Junior representative levels During his career at Eastwood Been won two Sydney premierships, played NSW 19 (2003) and Australian U21’s (2005) IRB world Cup in Argentina. 2006 would be Benn’s breakout year, he made his Super 14 debut for Waratahs against Queensland Reds in February 2006, playing 13 games that season. His performances saw him rewarded with a debut for Wallabies against South Africa in the Tri Nation series becoming Wallaby 814. Throughout his distinguish career Benn has achieved many milestones, he holds the Waratahs-record 148 Super Rugby appearances, placing him among the competition’s top ten all-time players, 2nd highest capped Australian Super rugby player. Became NSW Waratahs 163rd Captain 2012. Robinson is also Australia’s second-highest capped prop of all-time, with 72 appearances for the Wallabies. He last games was at Twickenham against England in November 2014 in front of more than 80,000 spectators. Away from Rugby, Benn has shown considerable promise in the media space where he has provided expert analysis and commentary for broadcaster Channel Nine during the 2011 and 2015 Rugby World Cups. Hosted numerous functions, including the 2015 Volvo-RUPA Awards Lunch alongside Fairfax Media’s Georgina Robinson. Wide World of Sports & Sunday Serve panel member (2011–Current). 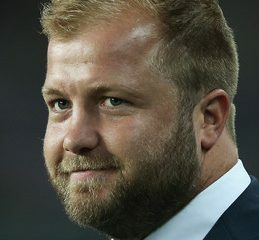 Benn is currently the Head Coach at Balmain Rugby Club and the player representative on the IRB’s judiciary panel (which gives you an insight into the high regard he’s held not only throughout world rugby, but also by his peers). His insiders knowledge of the game combined with his ability to communicate at all levels make him one of our most popular Rugby Speakers in both corporate and club settings.